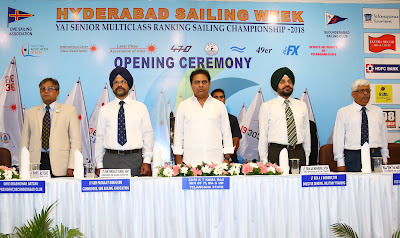 Shri KT Rama Rao, Honourable Minister for IT & Municipal Administration and Urban Development, Telangana State was the Chief Guest for the opening Ceremony and inaugurated the “Multi Class Sailing Championship” at Sailing Annexe in Hyderabad today. 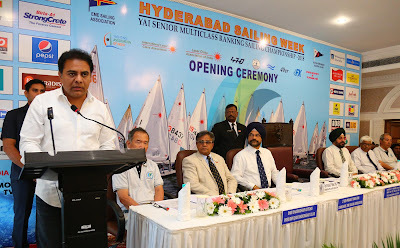 The event is being jointly organised by the EME Sailing Association (EMESA) and Secunderabad Sailing Club under the aegis of Laser Class Association of India supported by Sports Authority of Telangana State. Lieutenant General AS Bhinder, Director General of Military Training and Shri Shashidhar Batchu, President, Secunderabad Club were among other dignitaries who attended the Ceremony. Lieutenant General Paramjit Singh, Commodore EME Sailing Association, in his opening address, said “the response this year had been tremendous. A total of 170 entries from different associated clubs have been received, out of which 15 are in the women’s category. A total of 28 participants are from Telangana”. He mentioned that there would surely be a healthy competition in the highest traditions of sportsmanship and he was sanguine that there would be fair Sailing all through the Sailing week. Many trophies are at stake at the event including Late Lieutenant Commander Kelly S Rao Trophy, Rolling Trophy by Secunderabad Club, YAI Katari Bowl and number of individual medals to be won. 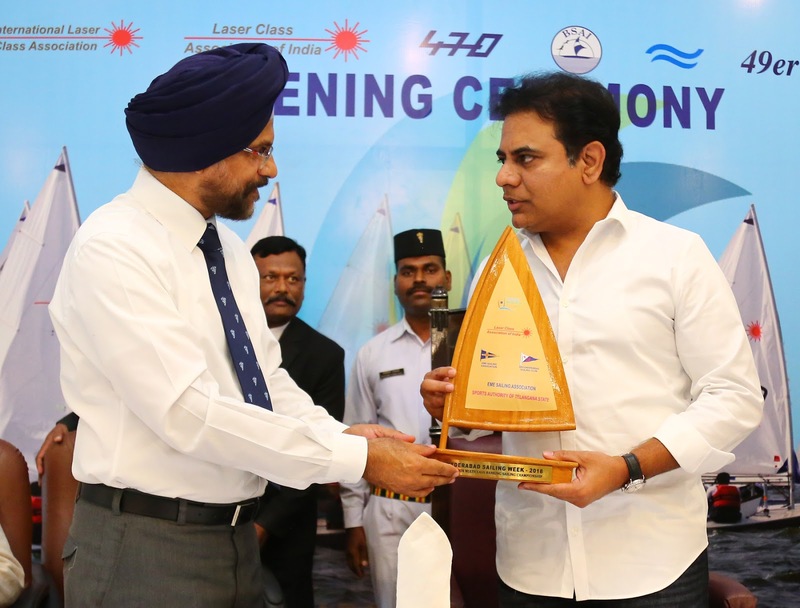 Shri KT Rama Rao in his address said, “the Government of Telangana had been giving many incentives for the sport of sailing and the vast expanse of Hussain Sagar Lake in the twin cities had proved to be a nursery for Champion sailors, many of whom have achieved National and International acclaim. He appreciated the efforts being put in by the Laser Class Association of India (LCAI), Sports Authority of Telangana State and the host clubs in making the event a grand success over the years”. As the event enters its 33rd year, participants are expected to compete in races including a sizeable number of women sailors. Major General TSA Narayanan, Vice Commodore, EMESA, said “this is a landmark year for the EME Sailing Association as this year the event has been accredited as the YAI National Ranking Event where in the performance of the sailors will be ranked, which will give them points for selection into National team. EME Sailing Association was formed in the year 1964. The sailing association has produced a number of medal winners both at National and International level. In the year 1986 LCAI was founded with a view to promote sailing in the Country. Since then, the event has been conducted continuously for the last 33 years and is popularly known as “Hyderabad Sailing week”.